In my last post I talked about the five power vegetables you can grow in your home vegetable garden that contain the maximum amount of nutrients for a healthier eating lifestyle. Continuing on in this series of health, nutrition and the home vegetable garden, I wanted to turn to fruits today. Who doesn’t like a good bowl of mixed fruits to start a morning or along side your lunch. Of course, who wouldn’t want that bowl of fruit to come from their own garden. As I noted in my previous post, studies have shown that vegetables grown at home is far more healthier than what you can buy in stores, I believe the same would hold true for fruits as well. Todd recommends the following five fruits for daily consumption. Blueberries (all berries really), oranges, pineapples, mangoes, and avocados. For those of us who can not grow citrus fruits, Todd recommends replacing oranges with peaches, pineapples with either papaya or watermelon, and mangoes with apples. You can also replace avocados with tomatoes, which botanically is a fruit. There are a variety of berries you can grow, all of which range in ease of growth and soil types. Blueberries do best in a sandier soil where as I have had some recent success with raspberries in a traditional soil. Berry vines (and in some cases trees) can be purchased at any home or garden center for a couple bucks up through twenty dollars. Apple and peach trees will grow (for the most part) pretty much anywhere, but take time before you will receive fruit from them, so be patient. Watermelon, and other melons, can be grown each season, but many varieties do take up a lot of room, so plan accordingly. For more information on what super fruits you need to add to your eating plan so you know exactly what to grow, be sure to check out Super Fruits by Paul M. Gross. Vegetable gardening is a great activity. It gets you outdoors and is really one of the only hobbies that you can literally eat the fruits of your labor. Today, there is an emphasis on eating healthier, especially for our children, unlike anything I have seen in the past 20 years or so. 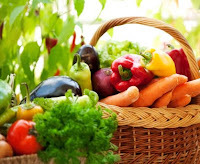 I recently posted an article on our blog titled, Home Vegetable Gardening: The New Prescription from Doctors and Nutritionists where I discussed the increasing trend of how health professionals are making home vegetable gardening the new prescription. I wanted to follow up that article with a list of vegetables that gardeners, looking to maximize their space, can grow to ensure they are eating the veggies that yield the highest amounts of vitamins, minerals and nutrients your body needs for a healthier you. I call them, the power vegetables. All 5 are easy to add to any home vegetable garden, although butternut squash will take up the most room, so you will want to grow them vertically if space is an issue, which you can read more about in Derek Fell’s book Vertical Gardening: Grow Up, Not Out, for more Vegetables and Flowers in Less Space. Broccoli, spinach and onions are cooler weather crops, where as the red bell peppers love the heat, so plan accordingly. If you are looking for alternatives for any of these as maybe you may not like the taste or flavor, Todd says you can substitute cauliflower, cabbage & zucchini for broccoli; acorn squash and carrots for butternut squash; arugula and other dark leafy greens for spinach; other members of the onion family such as shallots for onions; and other varieties (either sweet or hot) for red bell peppers. With your own home vegetable garden you have the ability to grow the foods your body needs to be healthier, and as we all know, and as studies have shown, home grown foods, taste better and are higher in nutrients than their store bought counterparts. What do you do with your pumpkins once Halloween is over? Ashley: Let them stick around through Thanksgiving. Scott: I added ours to the compost last year and a volunteer grew this year! Kathy: compost where they will come up the next year. Jennifer: If it is carved, it is wayyy dead after Halloween. Trash. Joan: Pumpkin pie, pumpkin bread, pumpkin soup, and of course, pumpkin seeds! Lynn-Marie: Put them out in the yard for the animals to eat over the winter. Upinak: Alaska Moose try to eat them. I only put them out the night of halloween. After the initial freeze, I thaw them out and begin to make pumpkin puree for muffins, bread, pies etc. Unless the moose get them! Kelli: feed them to my chickens..
Brenda: My husband puts them out in the field for the deer. Tammy: we play chunkin punkin!! Carolynn: roast the seeds in the oven and use the rest to make pumpkin chocolate chip cookie whoopie pies. Of course this is from a painted pumpkin, not a jack-o-lantern. Jane: I put some in the compost pile and leave some out for the squirrels. Joanna: I just a picture of a pumpkin martini so now I'm thinking pumpkin liqueur has to be the way to go....! Christa: right back into the gardens. This year I had beautiful volunteer pumpkin plants. Mark: Pumpkin pie...what else, after all it seems everything people buy at the store is making them sick. Growing your own is the BEST! Pamela: I like to line them up along the back of my empty garden.They give me something colorful to look at from my kitchen window.The squirrels love them, and they usually eat most of them before we get a hard freeze...which really does them in. I love pumpkins!! I try growing them every year...never much luck, but it sure is fun to try! C'mon SPRING! Michele: Cut them in half and let my chickens eat them! Laurie: compost- but gotta roast the seeds!! Teresa: Feed them to the PIGS! Sally: The little piggies get dessert. Cheryl: give them to the critters! Iron Oak Farm: Feed them to our goats and chickens. Be sure to check out these great books on what to cook or bake with your leftover pumpkins. Not too long ago I had the privilege of instructing a class on the basics of home vegetable gardening at my local library. During this class we went over such things as getting your garden ready, enriching your soil through composting, organizing the layout and of course managing the garden once it was all put together. During the course of the evening I got to meet some wonderful people who are just as passionate as I am when it comes to home vegetable gardening. One of the gardening enthusiasts that I met did all of his gardening in a local community garden. Living in an apartment complex this gentleman did not have his own land but instead took advantage of the apartment complexes community garden. The apartment owner had set aside a large piece of his land so that his tenants could use it to grow a garden. What they grew was up to the tenant who was assigned a piece of land, it just had to be legal and you had to care for the plot of land, meaning it could not look like an overgrown mess. The charge was $20 to rent a portion of the land for the entire year and you were given 1st dibs to rent the same plot (or more) the following year. This got me thinking about how a community garden could be a great thing for many people who have little space and is it possible to start a community garden in any area of the country. So I started doing some research on the topic. What I found was, maintaining a community garden is no different then if the garden was in your backyard. There are just a few caveats. 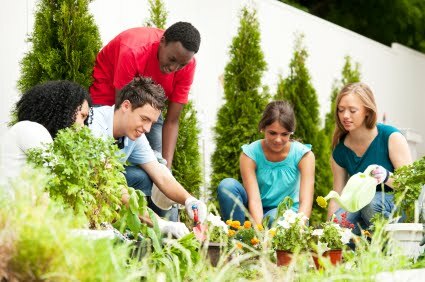 The first thing you need to do is put together a committee for the community garden. Since, by definition, a community garden is maintained by a community of people, it goes without saying that putting together a committee to work on issues you may face will keep it organized and structured. Usually a committee consists of (all volunteers of course) a president, a vice-president, secretary and treasurer. Yours may differ but this is usually the standard for any organization. Once you have your organization in place you need to find some land. This can be as simple as going to your local township government council and asking if there is any unused land that your group can use to garden on, or using land at your local church or place of worship, up through finding individuals who own land and are willing to let your group garden on it, sometimes for a small fee (or sometimes free as long as you maintain it properly). Before you ever put a seed in the ground or pick that first ripe red tomato, find out if you will need insurance. The last thing your township, church or land owner wants is some kind of lawsuit because food grown there might have made someone ill, or someone gets hurt during gardening. Two vast extremes I know, but you have to be prepared. How will your community garden work? Will you create equal sub plots on the land such as was the case with the student in the class I taught or make it one giant garden? Which direction you decide will be up to the community using the land. For instance if the community is made up of multiple families with the intention of growing food for themselves, your best bet is to create equal sub plots. If the intention is to grow food to donate it to a local food pantry, then one giant garden will work. You get the idea. Finally, in the whole idea of community gardening, be sure you get feedback from all of the gardeners in your group of what works, what doesn’t work, who had troubles growing items and so on. Having this information on hand and the answers to those issues will go a long way in making sure the community garden is a success. Be sure to check out these books on community gardening and of course CommunityGarden.org which has a plethora of information to get you started. 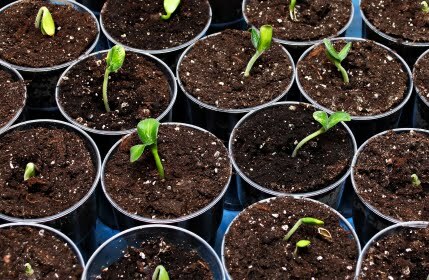 So you have decided to save even more money with your vegetable garden by starting your plants from seeds. There is no question that the amount of money you save when you start from seeds is tremendous. Seed packets range in price from a buck to three bucks and the amount of seeds you receive for such a low cost are just mere pennies (or less) per seed. Just because the cost is low does not mean you should not take the necessary steps to maximize the production of the seeds that you do buy. Here are some tips that I have outlined to help you do just that. Give your seeds a head start before the frost ends by starting them indoors. Find a location in your home such as a window sill, that receives sunlight first thing in the morning. By placing your planted seeds in this location three to six weeks prior to the end of frost in your area, your seeds will have sprouted and you can move actual plants outdoors. As a note, just because frost ends in your area does not mean that all plants can be moved outdoors. For example, tomatoes and peppers love hot weather, so you will want to plan appropriately for your area when those weather conditions occur. Use a good seed starting soil. If you have been conditioning your own garden with composting techniques and manures, then by all means use the soil from your garden. Transplanting will be a lot easier. Just remember that if you are taking your soil from the outdoors to the indoors to let it warm up first before you plant a seed in it. If using your own soil may not be ideal for you, use a good seed starting soil available at any home or garden center for just a few bucks. They retain moisture very well and are produced for seed starting purposes. Think of a propagation dome as a mini-greenhouse for indoors. Propagation domes allow for a better environment for your seeds to start by allowing the air around the seeds to be a constant yet warm temperature. This increases the chances of the seeds to germinate and at a quicker pace (sometimes). They are available at any home center or online and can cost anywhere from three dollars up through fifty dollars, depending on how advanced you get. You can also create your own by using yogurt cups as your seed starting pots and then placing clear plastic bottles over top. Do not over water your seeds. Over watering will prohibit your seeds from germinating in many cases. Just a light watering will do. If you are using a propagation dome, I have found in my own experiences, that you lightly water your seedlings once in the beginning and won’t have to water again until you move them outdoors. Your results may vary. Hardening off is the process of acclimating your seedlings to the outdoors. If you simply take your seedlings from the indoors directly to the outdoors you may shock the new plant and their growth could cease and/or the plant could die. 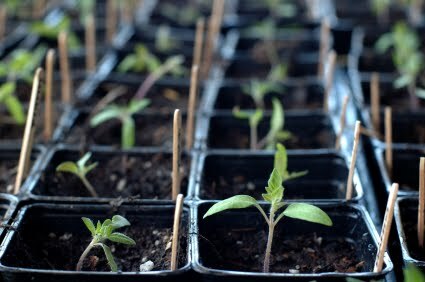 Get your new seedlings used to the outdoors first by moving them out during the day when temperatures get better and then bring them in before it cools down at night. This will help increase the plants chances of success when you finally move them to the outdoors. As a side note, if you are growing root crops such as carrots, beets, turnips and so on, it is best to start them directly outdoors when the temperatures allow. Try to use seeds that are newer than five years as the germination rate of seeds decline for many varieties past the five year mark. When not in use, be sure to store your seeds in a cool, dry location to maximize their life span. As for a very popular question asked, “should I soak my seeds before planting?”, I rarely do it and have had great success, others swear by it for such seeds as beets, peas and beans. Experiment and see what works best for you. While finishing up a project I was working on the other night, I was flipping through TV stations to at least put something on that was watchable as background noise. I came across an infomerical selling some new great weight loss product that is guaranteed to give you those 6 pack abs and rock hard muscles in as little as 20 minutes a day. I am not a dietitian or nutrition expert but common sense would leave me to believe that a healthy eating regimen combined with exercise would yield a healthier “you” with or without that piece of equipment that costs 4 easy payments of $99 per month. The commercial, if nothing else, did make me think about something and that was how can you tie in a home vegetable garden with a healthier eating lifestyle. I mean, after all, fruits and veggies by definition are healthy for you. I recently brought up this topic to food and nutrition expert Jill Nussinow, MS, RD, author of the book The Veggie Queen: Vegetables Get the Royal Treatment and the creator of the DVD, Pressure Cooking, A Fresh Look: Delicious Dishes in Minutes. Jill is a registered dietitian who also teaches cooking classes. She recommends to her students that they should always grow their own fruits and vegetables. She had one student who grew a large garden and was able to lose 10 pounds by adding into her healthy eating habits the fresh fruits and veggies she grew herself. Freshness, flavor, likeliness of consumption and pick what you need are just some of the reasons why Jill recommends to her students that they grow their own. Vegetables you grow yourself will always be fresher than what you can buy in the store and have a better flavor too. She says that you are more likely to consume what you grow since you will be growing what you like to eat and she says that waste will be at a minimum because you can wait and harvest only what you will consume. There is enough research out there to prove that adding fresh fruits and veggies to each of your meals is a great way to excellent health. So, is having a home vegetable garden the new prescription from doctors? In an environment where “fast” food is becoming the norm, doctors prescribing home vegetable gardening as a remedy is a great start in moving away from unhealthy eating habits. Everyone listens to their doctor right? Once prescribed though it becomes the challenge of parents everywhere to not only take and use that advice themselves but also instill that lifestyle into their children so they can then pass it on to future generations. As a father of two children myself, I know it is important to me to do this as many other parents out there I spoke with. Registered dietitian Marcia Crawford, works with her clients to focus in on getting their children to enjoy the benefits of a “farm to fork” lifestyle. 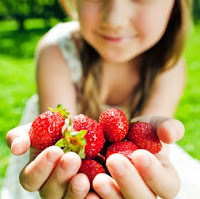 “The process always ends up with kids eating more produce. Inevitably the whole family gets involved. Meals begin to be planned and produce becomes the star of the plate, not an afterthought,” explains Marcia. Ms. Crawford, along with Dr. Daley and Ms. Nussinow, all agree that once you make fresh home grown produce the focus, the calories will decrease and nutrient density will increase with every meal. 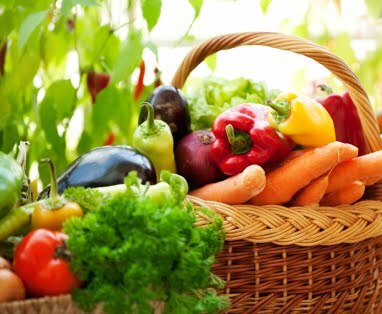 To determine the best way to incorporate your home vegetable garden with you and your family’s healthy eating style, evaluate a few areas first, so says nutrition expert and author of the book Nutrition Simplified: A Realistic 7 Step Workbook to Jump Start Your Metabolism , Betsy Markle, RD. “What are the fruits and veggies the individual likes/dislikes? Are there any particular meals or foods that they would like to make? For instance, I love making my own salsa so I try to plant most of those ingredients. How much space do they have? How much time do they have to spend on their garden? Where do they live (weather/garden time period)?” says Betsy. You must be able to honestly plan this out in order to make it be affective and work. If you can walk into your doctor’s office and get a prescription for pains and aches why not get a prescription from your doctor to grow your own fruits and vegetables? 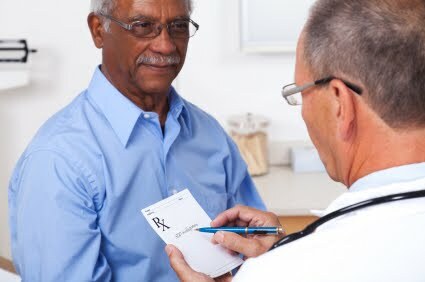 Maybe if more doctor’s made this prescription a staple to every office visit, more people would live a healthier lifestyle. To me, one of the great benefits of growing your own food is being able to control the environment around your garden. That means the ability to control what goes in the soil to feed your plants up through and including what is used to keep harmful insects off your crops. One of the best methods is to attract beneficial insects to feed on those insects that do damage. The most common example of this would be using ladybugs to eat aphids. This combination is very common. So common that you can buy ladybugs at your local garden store or online. However if “buying” bugs is not your thing, a great resource that I learned about after reading Chris McLaughlin’s book The Complete Idiot’s Guide to Heirloom Vegetables is Craig MacGowan’s Mac’s Field Guide of Good and Bad Garden Bugs. It is a chart that lists on one side all of the common good bugs and on the other side, all of the common bad bugs. The chart is laminated and costs about five bucks. There is a chart for every area in the country as insects will vary from one location to the next. I purchased one for my area, and this chart has become an invaluable tool that I use every season. I am able to quickly identify an insect and not only determine what it is, but why it lives in my garden and whether or not I should do something to get rid of it. You should always strive to attract beneficial insects to your garden as that will be not only the most cost affective means to get rid of harmful insects, but also the safest. However, it can be the most time consuming and at times frustrating. Homemade spray recipes have popped up all over the Internet as a means to use safe and affective means against bad insects. I recently had a chance to speak to one such recipe creator, Jeff Gordon of Green Gordo, an informational blog for folks looking for healthy eating and living alternatives. Jeff likes to use a hot pepper/garlic spray mix to handle the leafhoppers, aphids, and June bugs he sees every year in his garden. Using safe sprays, such as Jeff’s, are great, and just like Grandmom’s Chicken Noodle Soup, everyone has their own recipe. One might be thinking, “If you use these sprays, will they do harm to beneficial insects?”. In short, they might. Which is why I recommend that you attract beneficial insects first, especially if your are not inundated with harmful ones. If you are, then start using a spray to get that insect population down, or at least, under control, then wallop them with the one-two punch of beneficials. I am a very fortunate person when it comes to my vegetable gardening space. I have plenty to grow what I know my family will consume leaving plenty left over for friends, family and donations to our church and local food pantry. However, many people have emailed me with their concerns of limited space. They would like to grow vining plants such as cantaloupes, cucumbers and pole beans, but lack the space they need to simply let them “fan” out if you will. If you find yourself in this category, you are luck. You can grow these items, and many more like them, vertically. With vertical home vegetable gardening, the sky really is the limit. All you need to do is create a structure of sorts to give your plants something to hold on to. For heavier items, such as cantaloupes, you will also need to be a bit creative as to have something to hold up the fruit. An obvious solution for use of space that many people overlook is the back or front porch steps. Depending on which gets the most sun, porch steps make for a great area to use deep pots to grow many items, taking advantage of space that is otherwise not used. 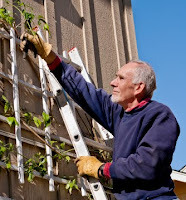 Along with the plentiful yields of great tasting fruit, veggies and herbs, vertical gardening makes garden maintenance much easier as all of the vines are off the ground, yielding a clear path to those pesky weeds that want to steal your plants valuable soil nutrients. Vertically gardening, as well as use of space, is only limited by your creative thinking. I have seen many gardeners use their existing fences for supports, pergolas, the roof tops of sheds, fire escapes (although I don’t think the fire department appreciates that one) and so much more. What empty space do you see in your area that could otherwise be used to grow great fruits and veggies? On a final note, herbs are a great to grow on indoor window sills. Just make sure you pick a window that receives sunlight first thing in the morning. It’s October. At this point, the season here in Western New York is winding down. This marked the first year I ever direct seeded every single plant in my garden. No buying plants at the nursery, or even worse, big box store. Just pull seeds from my alphabetized catologue, read the package and stick them in the ground at the appropriate depth. With the exception of peppers, everything came up. I let several “volunteer” tomato plants grow as well. One yielded huge, beefsteak type tomatoes. Another patch produced delightful cherry tomatoes. I also decided to let a tomatillo plant that reseeded itself from last year go and ended up with a prolific yield. Experiments in succession planting continue – after thinning beets, I planted broccoli almost too close. The broccoli finally looks big and healthy but if it yields florets it will happen sometime later this month. Corn was a dismal failure. It never got very large. It was looking close to harvest but puny compared to the roadside offerings in the neighborhood. Then the mean old racoons struck, pulling each ear half from it’s stalk and gnawing a bit before moving on to the next one. After years of dear problems, I didn’t have issues. The neighborhood coyotes seem to keep the rabbits in check. I suspect my fence succeeded, but if they wanted in, it would have happened. I won’t pretend I could keep racoons out. Spinach was a challenge to grow because it yielded so fast I had to be continuously re-seeding. Carrots always take longer to maturity than the package says. Weeds were another challenge. Anyone who works full time and gardens has, at one time or another fallen behind on weeding. It happened to me as well. I’m hoping for radish seeds in the mail because they yield so quickly I bet I can get some to serve at Thanksgiving. Find the time to be nice to your soil as well. Work in organic matter and spread a layer of mulch before calling it a year. Try to leave at least some of your space ready for planting. Next time I’ll talk about things you can try overwintering or seeding to grow as soon as the snow melts.